A massive, free, eight-mile street party connecting Walt Disney Concert Hall and the Hollywood Bowl, plus a free concert at the Hollywood Bowl! Join the LA Phil for a FREE celebration with hundreds of musicians, artists, dancers, family activities, and more! 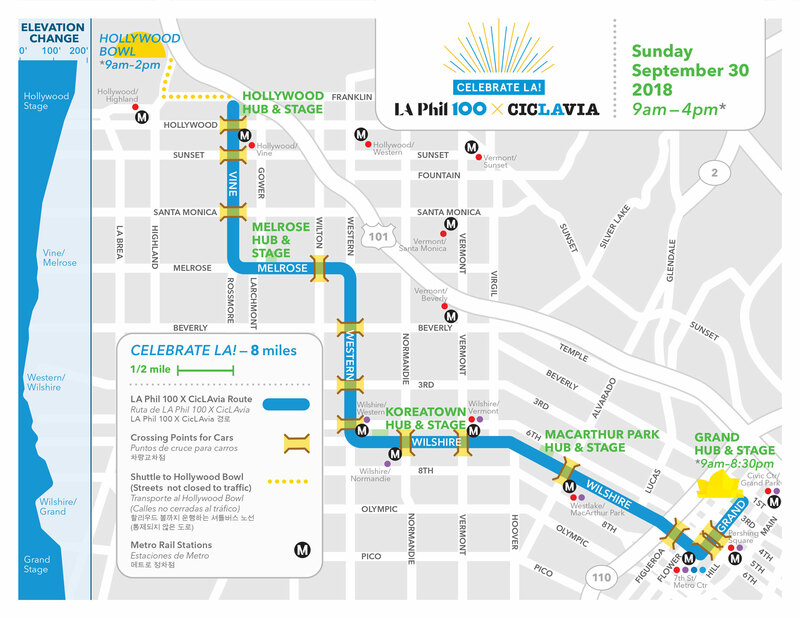 Be part of this history-making event as the LA Phil kicks off its Centennial season with an epic festival showcasing L.A.’s creative spirit, with 1800 musicians, artists, and dancers coming together to perform at the festival’s six hubs and along the eight-mile route itself. And that’s not all – the evening ends with a free concert at the Hollywood Bowl, where Gustavo Dudamel will lead the Los Angeles Philharmonic and welcome very special guests – including Katy Perry, Herbie Hancock, Kali Uchis, Youth Orchestra Los Angeles (YOLA), and more to the Bowl stage. Imagine the streets of L.A. without cars. In partnership with CicLAvia and Community Arts Resources (CARS), we’re making it happen. Starting at 9am, you’ll be free to walk, run, skate, scoot, bike, and wander through the car-free streets, where six hubs will play home to performance stages, art installations, food trucks, screen printing, family-friendly activities, and more. Think of it as an eight-mile free space saved just for you!